We've committed to doing the Miami race on New Year's eve. Working on the car is a little more frustrating than we thought. The D15 block is in the car, but it runs like the timing is off 1/2 tooth. At the end of the last race we had some problems shifting into 2nd and we reluctantly opened it up with the expectation it would need a sychro. Glad we did. 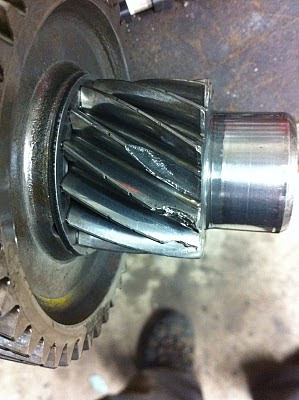 The countershaft was missing most of two teeth and would have locked up entirely if we'd done another race on it. Oh, and all of the axle boots are torn to shreads. On the plus side the lights we're adding will look really cool.